We are about two months shy of the 2013 NFL Draft and we are a few days shy of one of the most important steps on the road to the draft with the NFL Scouting Combine kicking off this Thursday in Indianapolis. 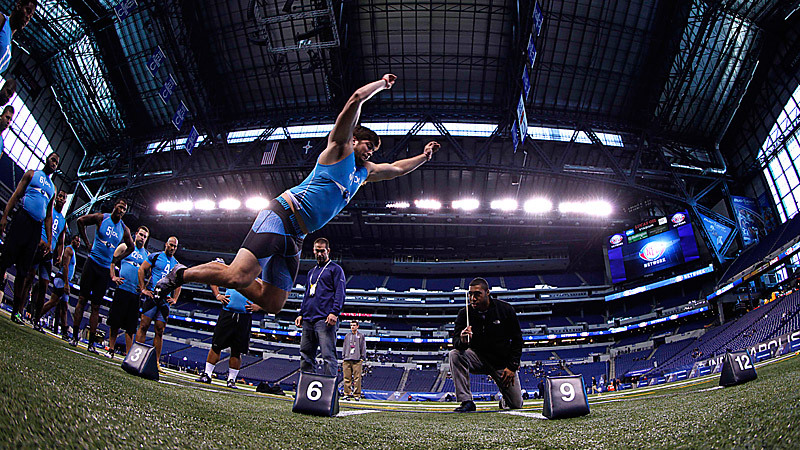 While there has been much debate how much a Combine performance matters on the football field, I have always thought that it carries too big of a piece of the pie, there is no doubt that it does play a role in a player's draft profile. With all of that in mind, here is what I think you need to keep an eye on at the Combine. All eyes are going to be on Te'o this week with focus not just on his interviews but also on his field drills. With all the craziness surrounding him and his fake girlfriend (it seems like it was so long ago), he had a lot of questions of his character surrounding his role in the whole scheme, whether or not he had a role and all that jazz and thus it will be critical how well he interviews with interested teams. But the dropping of Te'o's draft stock did not start with this fake-girlfriend nonsense but it began with his miserable performance in the title game against Alabama, where he, along with the team as a whole, looked absolutely lost. His draft stock was inflated beyond a point it should have been before that game and now it fell to its current spot in the mid-to-late first round spot. If he struggles in the drills, he may very well fall out of the first round altogether. It has become a clear consensus that this is a weak quarterback class, and more importantly, there is not a prospect that appears to be worthy of the top selection, even as I have mocked Geno Smith to the Chiefs in every mock that I have done because as we all know, quarterbacks get overdrafted and their stocks always end up going up. Remember, Cam Newton was not a consensus top overall pick until we got closer to the draft and there were a lot of folks that felt it was a mistake when it happened. But Smith is not the clear-cut top quarterback and there is a murky class around him with guys like Mike Glennon, Tyler Wilson, Matt Barkley, Ryan Nassib and E.J. Manuel all in the mix. The combine is a great opportunity for quarterbacks to show that they are worthy of a high first round pick as there are a bunch of clubs that need a quarterback and while Barkley will not throw, this could be one of those guys' moment. Remember when we all thought that Lattimore's career was in jeopardy after that gruesome knee injury that he suffered in late October against Tennessee? Well his recovery has gone much quicker than expected, with the help of the famous Dr. James Andrews, but he still won't be performing in drills this week. Lattimore was expected to be a first round selection before he suffered the injury, even as the stock of running backs as a whole has gone down in recent years, but even after the injury, he still is expected to be at worst a second day selection. If his medicals come out clean, there is a chance that he gets back into the first round. While Ogletree is certainly not the first player to come into the Combine with a bit of a checkered past, his will be a focus for teams that need linebacking help and could use a talent like his but could be turned off by his history. His freshman year was marred by an arrest and a charge of misdemeanor theft of a stolen scooter helmet. He was one of a few Bulldogs that was suspended for the first four games of this season for violating the school's substance abuse policy and he was charged with a DUI a week and change ago. Now while it was good for him and his agent to get ahead of the story, getting a DUI right before the Combine is not a good idea. He will have some questions to answer from teams in Indy about his past and his stock could be in the balance, potentially. Jones was considered one of the elite prospects in this draft but his stock has slipped a little bit over the past month over concerns of the spinal stenosis condition he developed at USC when he was a freshman. It didn't seem to affect Rob Gronkowski that much but anything involving the spine is not something to gloss over, or at least teams will think so. Another reason why some will think that Jones will go lower than he should is because there are reports that he is not a great workout guy and will not wow you at the Combine and during workouts. Personally, I think that's a ridiculous reason for a stud's stock to drop but we have seen many a great prospect fall for questionable reasons and thus it's a key reason why you should keep an eye on Jones this week. Ansah has had the reputation similar to that of Jason-Pierre Paul as he is very raw and has only been playing football since 2010. He's the classic supremely athletic pass rusher that is extremely talented, but also comes at a big risk. His stock really began to rise after a tremendous performance down in Mobile at the Senior Bowl, particularly in the game, and he is expected to blow up the Combine. But due to his inexperience with the game, there will be a lot of eyes on his technique during the field drills and if he is a mess there, his stock could fall again. Teams will always need pass rushers and ends always seem to be the ones blowing up the Combine so with a strong performance, Ansah could push his stock into the top ten safely.